This week I'm challenging myself to prepare meals using things I already have in the fridge or the pantry. Of course, my pantry is huge. (It used to be a full bathroom with a tub and everything but the previous owners took it out and turned the room into a pantry.) 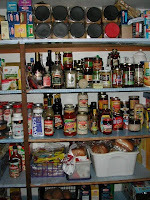 I have more stuff in my pantry than a small store so it shouldn't be *too* hard. I also have plenty of peppers, tomatoes and fresh herbs in the garden and way too much stuff in the freezer. 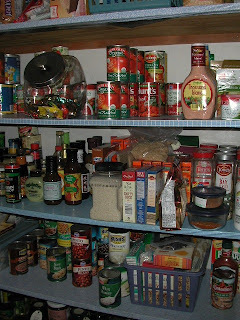 I'm really trying to use up some of the stuff in my pantry because this fall I'm hoping to tear out the existing shelves and redesign a much more functional storage space. At the moment I have *way* too much stuff in there to even begin to think about starting the project. Sunday: Last weekend of summer weather: play it by ear! Picnic in the park? Cook out on the grill? Chicken, one way or another! Saturday: It's Jake's Birthday! Gotta be Pizza Night! What a great idea. I need to eat the food we have at home before I go out and buy anythiong else. I'm sure we could last for a week or more. You've inspired me to clean out my pantry. Hope the challenge went well and that you enjoyed the gumbo!